Three weeks after HootSuite announced that Instagram and SlideShare had been added to its App Directory, the social media management dashboard has now launched a new AutoSchedule feature to its Hootlet browser extension, which is available for Google Chrome, Firefox and directly on the HootSuite dashboard. 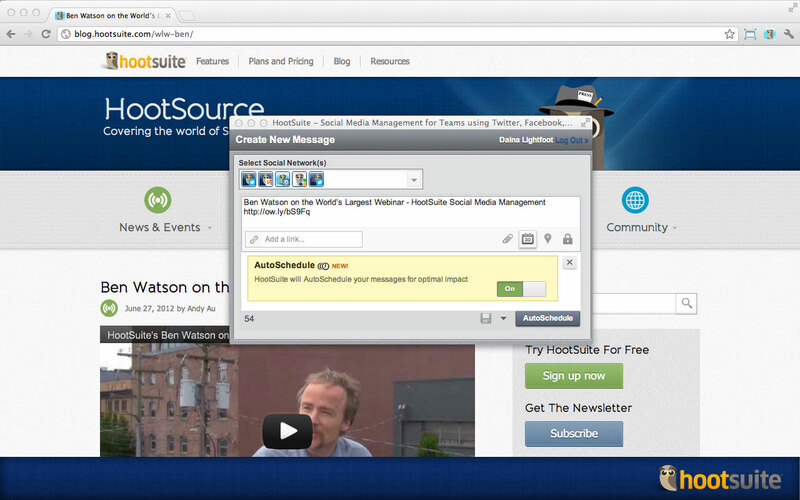 HootSuite launched Hootlet back in 2009, offering an easier way to share a link through HootSuite. You hit the Hootlet button (a small owl icon on your toolbar) on any given webpage, and your tweet is pretty much good to go, with a shortened URL. It also lets you specify exactly when the tweet will be sent. Now with AutoSchedule thrown into the mix, it analyzes users’ social activity (and their followers’), automatically delivering each message at an optimal time to avoid swamping followers with too many updates at once. In addition to AutoSchedule, the Hootlet extension also introduces a custom content sharing feature, which can be used to highlight custom text or images on websites. Bringing the AutoSchedule into the mix makes a lot of sense and certainly speeds things up a bit. Though it does mimic the existing functionality of Buffer (which we’ve written about before) somewhat, with one major key difference. With Buffer (including its very own browser extension), you pre-set the intervals at which your tweets are sent out. With Hootlet’s AutoSchedule feature, it connects with your followers at optimal times selected by a “smart algorithm”. So in effect, you can pile up as many tweets as you like, and Hootlet will schedule them for you. You can turn the AutoSchedule feature on or off with one click. At launch, the new AutoSchedule feature is limited to the two browser extensions, thought it will be arriving for the main HootSuite dashboard later this summer. Meanwhile, check out the new AutoSchedule promo video below.